Blended from a selection of fine malt whiskies – including Strathisla, from the oldest operating distillery in the Highlands. The result is a rich, generous whisky with honey and hazelnut notes, and a long, creamy finish. 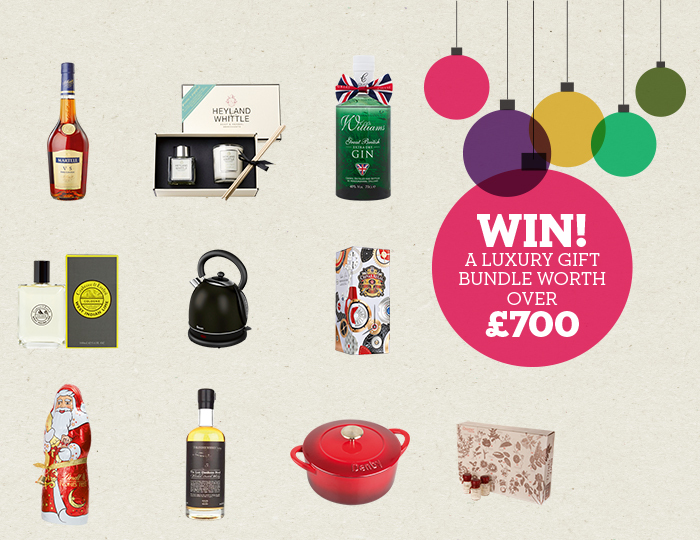 For the chance to win all these fabulous gifts, simply enter code VOU5705446 when you place an order for delivery between 21st October and 7th December 2014. 1. This prize draw is open to Ocado customers who have placed an order for delivery between 21/10/2014 and 07/12/2014 and entered the voucher code VOU5705446. 2. Orders placed for delivery outside of these dates will not be included in the prize draw. 3. This prize is non-transferable and there is no cash alternative available for any part of the prize. 4. The winner will be drawn at random by Ocado Retail Limited in the week commencing 08/12/2014 and will be given full details of how to redeem the prize. 5. Prize must be redeemed within 14 days of the closing date of the draw. This entry was posted in Competitions and Prize Draws, Freebies, Talking Ocado and tagged blended whisky, case iron, Chivas Regal, Christmas, Christmas Shop, competition, Crabtree and Evelyn, Denby, Drinks By The Dram, enter now, Festive, free, Freebies, giant santa, gifts, giveaway, hamper, Heyland and Whittle, homeware, kitchenware, Lindt, Martell, Ocado, Ocado deliveries, Ocado groceries, ocado.com, presents, Prize, scotch, Sizzle, Swan, tableware, The Ginvent Calendar, The Lost Distilleries, whisky, Williams Chase gin, Win by Ocado. Bookmark the permalink. Brilliant service can’t fault . Looks like fantastic prize,would be great for Christmas. Interesting article, do not forget to visit the http://moblog.esy.es . No news, articles, etc. If the competition closes on the 7th December then there’s going to be some catching up to do on the Ginvent Calendar when it arrives! hope we can be the winners ❤ ❤ ❤ HAPPY CHRISTMAS ❤ ❤ ❤ we are far away for our family but our heart will be in theirs on the Christmas day 🙂 !